When life is busy and hectic, it can be easy to forget that you’re better than a frog. If you’re feeling worse than a frog, here are some simple mental exercises you can practice to affirm that you are, in fact, much superior. Perhaps you’re feeling insecure that frogs have long, sticky tongues that can catch insects, whereas your tongue is not long or sticky at all. Although your tongue may be worse than a frog’s, this exercise will remind you that your hands are way better than a frog’s hands, capable of performing complex tasks like opening a can of soda or writing a letter to your landlord. A frog could never do those things! 2. 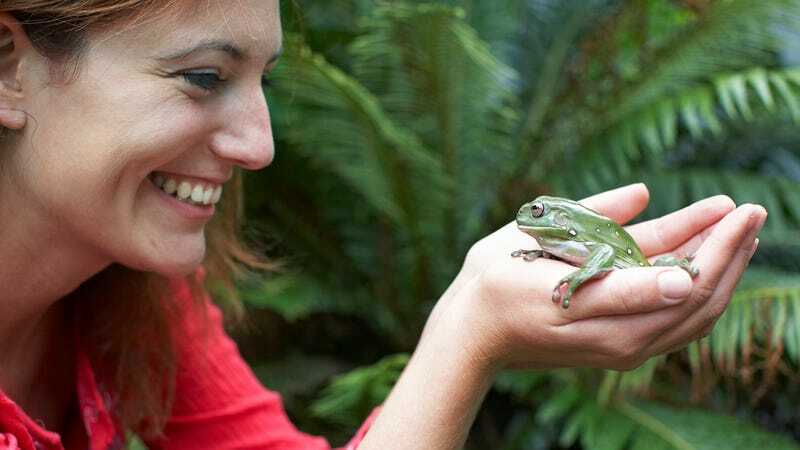 Stand up on your tiptoes and concentrate on how much taller you are than a frog. Even the tallest frog in the world wouldn’t come close to your knee in height. You are a giant compared to frogs, towering over every amphibian on Earth, and that’s a fact you should be proud of. 3. Examine your human skin and meditate on how it’s just as good as a frog’s green, slimy skin. Your human skin is neither better nor worse than a frog’s skin, so you shouldn’t feel inadequate just because you aren’t green or covered in mucus. Whether your skin is green and slick with ooze, or not-green and dry, it doesn’t matter. Humans and frogs are tied when it comes to skin. This realization should free you from stressing about how your skin measures up to a frog’s and allow you to instead focus on the ways in which you are better than frogs. 4. Light a scented candle and open your wallet to count your money and credit cards, items no frog owns. Frogs are very poor, but you have money and credit cards. In terms of net worth, to impoverished frogs you are like a fantastically wealthy king. Even if you are in deep debt, you still have the respect of financial institutions, who value you as a human that is capable of mailing in payments. A bank would never even bother to send bills asking a frog to pay off a loan, because it wouldn’t loan money to a frog under any circumstances. That’s a simple truth that a non-frog like yourself should find profoundly soothing. Sometimes, you have to look at a frog to know you’re better than frogs. If that’s what you need, take a relaxed stroll down to the nearest pond and make eye contact with a frog. As your gazes lock, allow yourself a silent moment of thoughtful contemplation. When you’re done, you’ll know that you’re better than frogs, and it’ll seem as though the frog understands that you’re better than it too.